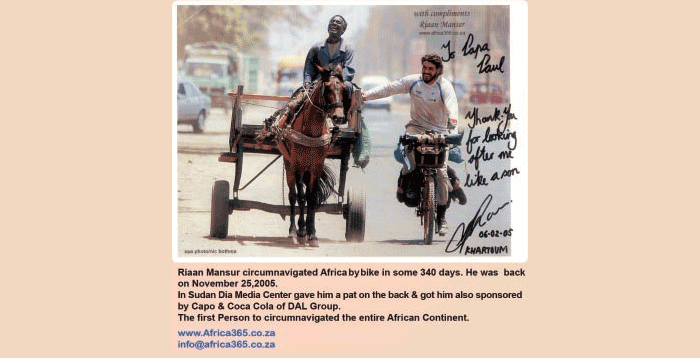 Riaan Mansur circumnavigated Africa by bike in some 340 days. He was back on November25,2005.In Sudan Dia Media Center gave him a pat on the back & got him also sponsored by Capo & Coca Cola of DAL Group.The first Person to circumnavigate the entire African Continent. Summary In this day & age of the 21st century one would think that all credible world first explorations have been done… but they haven’t. The past twelve years, Riaan Manser has re-written the definition of tenacity & become the epitome of courage & determination. Manser rose to prominence on becoming the first person to cycle around the perimeter of Africa. For over twenty four months, alone & unaided, he pedaled a staggering 37,000 km through 34 countries, some of which rank as the most dangerous countries on Earth. Manser’s achievement earned him the title “OutThere Adventurer of the Year 2006” & his book, “Around Africa on my Bicycle”, became a bestseller. In July 2009, Manser set another world first when he became the first person to circumnavigate Madagascar, the world’s fourth largest island, by kayak – also alone & unaided. This colossal journey, which saw him paddle 5000km in eleven months. March 2011 saw Riaan begin his next challenge. This time he took on mystical Iceland & her arctic waters with a handicapped partner who has mild cerebral palsy. “Around Iceland on Inspiration” saw the two paddle 2300km to circumnavigate Iceland in adouble sea-kayak over a five month period. AFRICA TO NORTH AMERICA Riaan has always vowed that he would never expose his girlfriend of 14 years, Vasti, to the dangers of his world; but now the dynamic couple made history by taking on the vast waters of the Atlantic. Alone & unaided they endured a three months & two weeks crossing from Agadir, Morocco & landed in Miami, Florida on the 7th of May. Their final destination, the Statue of Liberty in New York. Not only did they make history by being the only people to have rowed from mainland Africa to mainland North America, but Vasti also became the only woman from the African continent to have rowed across any of the world’s oceans. The beard would not be denied. He burst into an anti-American tirade, spattering me with saliva, then ran out after me when I left the shop to shove a handful of pictures in my face depicting a variety of dismembered and beheaded corpses. ‘This will happen to you!’ he shouted. ‘Before you leave our country, this will happen to you, you filthy American!’ He was literally foaming at the mouth by this time. Just then a bus came past and I jumped on it. Undeterred, he ran next to it for about 100 meters, haranguing the other passengers in Arabic, while I sat there with my stomach cramping with horror as I remembered some of the pictures. Wadi Halfa was deserted when we landed. I decided to; make dash off the ferry ahead of the others to snap up the first available transport out of there – the day was almost gone, and I didn’t want to waste what was left. It was very close to Christmas, and a multitude of delays in Gabon the year before had taught me to avoid holidays when applying for anything, or you were likely to end up waiting for the right person to get back from leave. According to my ‘Lonely Planet ‘ guide there was a train service to Atabara with a connection to Khartoum, and I reckoned that if I could get there before Christmas Day I would be able at least to submit my application to the Eritrean embassy before it closed. At first it seemed that my frantic dash had been for nothing, since it turned out that the train wouldn’t be leaving for two days, but then it paid off when I found myself at the front of the queue to get a mud-walled hotel room. It was nothing to write home about, but the twice-weekly ferry’s passengers quickly soak up what accommodation there is. Next in the queue were the Japanese man and had been travelling separately and had met on the ferry. The man, Akira, was an experienced cyclist, although I didn’t think he was properly equipped, since he had a racer-style bike with drop handlebars and thin-tyred 26-inch wheels. The woman, Sakurako, was on a lone tour down to Ethiopia via Egypt. This struck me as being a somewhat hazardous trek for a lone woman, but she scoffed at the mere thought of her being unable to protect herself. Akira planned to reach South Africa in about three months, and it would have been nice to team up with him for the home stretch, but he was set on following the conventional tourist cycle-route, whereas mine lay eastwards through Eritrea and Djiboutii towards Somalia, a place he wanted to steer clear of, for which I couldn’t blame him. I would just have to hope that I could link up with someone south of Somalia. In the Sudan all tourists have to get a travel permit within three days of arrival, buy Sakurako and I decided to travel to Khartoum before getting ours because the price of $25 we were quoted at Wadi Halfa was suspiciously high (we were wrong, incidentally). Our tickets were pretty extortionate, too, considering that each of the train’s carriages consisted of little more than a holey metal frame with broken windows through which large quantities of desert dust constantly blew in. Our fellow-passengers lolled around, obviously used to all this, but Sakurako and I were very uncomfortable. Fortunately she had a couple of surgical masks, like the ones people wore when the deadly flu strain had hit Asia, and these helped to keep most of the dust out of our lungs. From time to time I went to the back of the train to see if my bicycle was still in one piece. This entailed running the gauntlet between groups of men who had gathered there to do some dedicated drinking and were sometimes distinctly aggressive towards me – mainly, I think, because they were upset at a stranger catching them in the act of boozing a good Muslim was not supposed to do. As if all this was not bad enough, our plans took a serious knock as a result of what can only be described as an act of God. One of the passengers died, and – unbelievable as this might sound – the train stopped at the next village so that burial preparations could be started and the necessary prayers offered up by the imam at the local mosque. This cost us six hours’ travelling time, with the result that when we finally chugged into Atbara on the evening of 24 December the connecting train was long gone. the railway station in a sort of tent which I constructed by leaning my bicycle against the wall and lashing my plastic tarpaulin to it. The only good thing about this humble abode was that we got a free Christmas present next morning, in the shape of a early awakening by a goods train that rumbled in and set the whole platform vibrating. To my surprise the goods train was emblazoned with the remains of what appeared to be the old South African Railways badge, and later on I was told that once up on a time, apartheid or no apartheid, the South African government had built up a very efficient rail service for the Sudan. Our most urgent requirement was to get our travel permits at the local police station and the find some other transport to Khartoum, since the next passenger train would not be leaving for 10 days. However getting the permits proved impossible because the police station was closed for Christmas Day and Boxing Day – rather odd, seeing that the Sudan was a staunchly Muslim country. No doubt this was a distant hangover from the pre-independence times … a holiday is a holiday, after all. My main feeling was one of frustration. How was I ever going to make it home? It was ridiculous situation. The townspeople we spoke to about this warned us that the police had been known to arrest tourists without travel permits, yet they had made it impossible to get the permits. In any case, who had ever heard of police stations closing down on public holidays? But that was our problem, and it was quite a serious one. Travelling through the Sudan, especially the way we were doing it, was a tricky business because it was an unstable county – more unstable, in fact than any place I had encountered since leaving West Africa. To get to Eritrea, my next stop, I would have to go through some potentially sticky places. Travel permits were a vital necessity in a country as war-jittery as the Sudan. But it was obvious that Sakurako and I were not going to get anywhere in Atbara within the three-day grace period, so e managed to buy tickets for a bus leaving for Khartoum on Boxing Day. We arrived in the early hours of 27 December, found ourselves a cheap hotel and later that day finally got our permits. Obtaining them was simple: you paid your cash and were given the permit without so much as a question about where you intended to travel. This seemed rather illogical, considering the insistence on getting the permits in the first place; actually it wasn’t, because unbeknown to us they were for Khartoum and its suburbs only. It was all too reminiscent of my experiences in Mauritania, and I began to feel uneasy. I was also suddenly bereft of enthusiasm, which was not like me at all. I should have been excited at the prospect of arriving at the confluence of the fabled Blue and White Niles, and chatting to the locals about the situation in their country (at that time Darfur had dominated discussions in the world’s humanitarian community for at least a year). But I just couldn’t work up any eagerness. Looking back, it is clear that I was suffering from a sort of battle fatigue after well over a year of working my way through more problems, dangers, hardships and general vicissitudes than most people would face in an entire lifetime. The human spirit is a vastly dynamic and powerful thing, but it is not a bottomless well, and I had drunk very deeply from it in my long journey along Africa’s coast. Khartoum itself was not an impressive place. In the city centre there were uninteresting high-rise flat complexes, but elsewhere the architecture was what one could call /Arab traditional’, so that you didn’t know whether it was old or new. The dust was universal, though. Technology did not seem abundant, with everything operating manually, and the airport was potentially life-threatening because it had no safety zone around it, so that it was slap bang in the middle of housing developments and industrial areas. Where else would you have aero planes landing literally inside a city? My spirits got a wonderful boost when I went to the South African Embassy to make my number and met the second-in-charge, Mr. Ebrahim Edries. My shabby treatment at the hands of his Cairo opposite number was still fresh in my memory, but Ebrahim proved to be a different kettle of fish altogether. He and his staffers were extremely helpful, even though they were up to their ears in work because President Thabo Mbeki was flying into Khartoum that very evening, preparatory to signing a peace treaty in Nairobi. In fact, Ebrahim made my day by asking me to meet with President Mbeki if this could be arranged, something I really wanted to do …clearly Khartoum had more in store for me than I had expected! Naturally I agreed, and Ebrahim put me on stand-by because Mr. Mbeki was on a very tight schedule because of his date in Kenya. The forthcoming meeting excited much interest among the locals with whom I discussed it. One of them (Who told me to call him ‘Mr. Moon’ because his Arabic name was so difficult to pronounce). Very smart in a khaki safari suit and ivory-handled walking stick, asked me to convey his personal thanks to Mr. Mbeki for his efforts in bringing peace to the country. I promised to do just that, and also prepared my own tale about how his portrait had literally saved my bacon in Liberia. year holiday season. Mr. Mbeki was a conspicuous exception to the general holiday fever, incidentally, as he made clear at a press conference when a journalist asked whether he would be doing anything special for new year’s Night. His reply was that New Year was just another day for him, and that as president he could not confine himself to dates on a calendar. But this particular New Year’s Day, Mr. Mbeki, was something special for the Sudanese people. A number plate reading NO FOOD FOR LAZY MAN would have been a suitable gift for him, I thought. In between all this excitement Sakurako and I, sticking together as a team, roamed around Khartoum, tracking down the embassies at which we needed to apply for visas. Both of us needed them for Ethiopia, but I also had to get ones for Eritrea, Somalia and Djibouti. Once again Christian holidays kept getting in our way in this Muslim city. But we kept going, frequently getting lost among the featureless flat complexes in the city centre (well, I kept getting lost, a situation Sakurako didn’t fail to comment on. ‘you go so far, so long, around all of Africa, by yourself’, she would say in her clipped Japanese accent, ‘and now I ask where is hotel and you get lost every day? This is crazy! My ego was slightly rattled, but I had to admit that she had a point). Lost or not, we usually ended up passing the best fruit-juice restaurant in town. Although almost every fruit shop sold cold pureed juice, which really helped to flush away the layers of dust that had built up in our throats during the day, this one had a bigger variety than the others and also offered various sweet porridge-type meals. A tasty staple item was ‘fool’, fava beans with olive oil, tomatoes, onions, chillies and grated eggs, sprinkled with goats’ cheese. This mixture was usually mashed a bit with the side of a Coke bottle and served with hunks of dry bread which doubled as the diner’s eating utensils. No doubt the affluent ate all sorts of other Sudanese dishes, but what I could afford was fool, and I ate it every day, and I ate it every day, and enjoyed it. The only problem I had with it was with the table manners, so to speak, of the locals who sat alongside me on the ground outside the shack from which the food was served. These characters espoused the wide-open-mouth eating technique, and the squishing, slapping and slobbering was awful to listen to, not to mention terrible to see. There was absolutely no reason for this disgusting way of eating. If the food had been tough or hard to break apart, it might have been excusable, but soft little beans and bread? I kept my peace, however, because interfering in an entrenched cultural usage is a waste of time. Aaaaagh, international dining etiquette could be a thorny path! The other roadside entrepreneurs I patronized on a regular basis were the jebena (coffee) ladies, who sold coffee milled, brewed and strained directly into tiny little shot glass-type china cups. The coffee was good, cheap and helpful in creating more opportunities for me to practice my ever-improving Arabic. My daily encounters with the fool-eaters were nothing serious, of course, but I was a bit shaken by something infinitely more sinister. One day I went to a roadside supermarket near the embassy to get a cool drink. The staff knew me from previous visits and, as usual, gave me a friendly reception. This day, though, there was a stranger present, dressed entirely in Western fashion but sporting a very long beard and very short-cropped hair, who wanted to know where I came from. I told him I was a South African, to which he replied: ‘ I know you are American. I can see and smell you are American.’ I tried to lighten the tone of what was obviously about to turn into a very heavy conversation, but the beard would not be denied. He burst into an anti-American tirade, spattering me with saliva, and then ran out after me when I left the shop to shove a handful of pictures in my face depicting a variety of dismembered and beheaded corpses. ‘This will happen to you!’ he shouted. ‘Before you leave our country, this will happen to you, you filthy American!’ He was literally foaming at the mouth by this time. Just then a bus came past and I jumped on it. Undeterred, he ran next to it for about 100 meters, haranguing the other passengers in Arabic , while I sat there with my stomach cramping with horror as I remembered some of the pictures, hoping that he wouldn’t succeed in working anyone up. That wasn’t the last of it. I encountered him three more times before leaving Khartoum, and each time he followed me to whichever place I was going to drink tea, the rant on and on about America’s iniquities while handing his horrible photographs around. If this had been South Africa I would have dealt with him, but I wasn’t going to try anything in a foreign and repressive country like the Sudan. His efforts weren’t successful: one shopkeeper came out to chase him away, but otherwise all he achieved was to provide some amusement for other locals. Just how out of touch I had got with events elsewhere in the world was brought home to me when I happened to catch a news broadcast on a small TV in the Eritrean embassy’s foyer and found out for the first time about the great Asian tsunami disaster that had taken place four days earlier. When I asked the others present what it was all about they were as surprised as I was that I knew nothing about this huge disaster in which hundreds of thousands of people had died. I mourned for the dead and felt ashamed that I had been so wrapped up in my own little world, so far out of touch with reality. Of all the wonderful people I had dealings with in Khartoum, pride of place must go to the incredible Paul Azzo, whom I met quite by accident. Paul was a one-of-a-kind man if ever there was one. 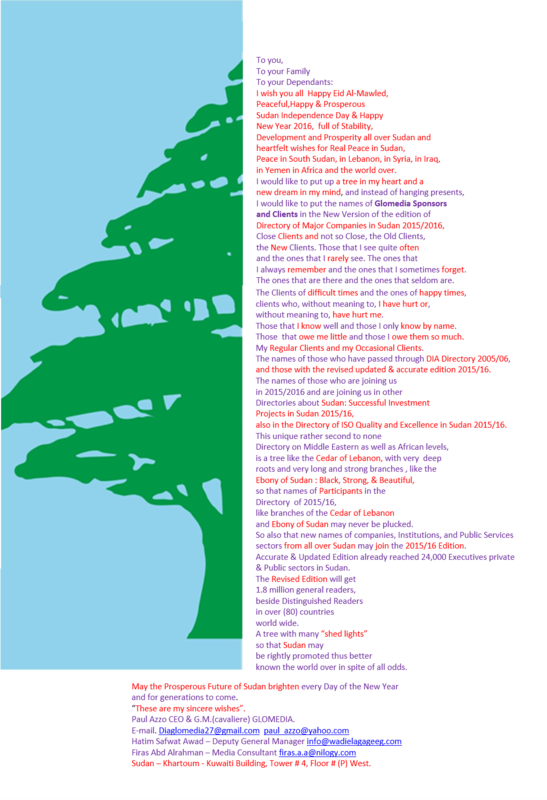 A Lebanese citizen but a Sudanese businessman, to use his own description, he was 70 years old but looked much younger and packed an unbelievable amount of vigour, intelligence, humour and passion for life into his diminutive frame. He had been knighted by the Italian government for services rendered and when I met him was furiously busy on his latest challenging task, compiling the first-ever Sudanese business directory. Paul did so much for me out of the pure goodness of his heart that it is difficult to describe how much it meant to me. After a meal or two – which invariably stretched out into hours of conversation – he had me sized up. He knew exactly who I was, what I was trying to do and how seriously I needed financial help (a ‘pat on the back’, as he put it). Being Paul, he then started doing something about it. He persuaded me to stay on for another week, moved out of his office bedroom to a friend’s home so that I would have a place to sleep and gave me pocket money along with instructions to ‘discover’ Khartoum while he negotiated with various of his business friends. Some of them were South Africans, and two in particular, one from Capo Dairy and the other from Coca-Cola, were of immense help. Capo Dairy and the other from Coca-Cola, were of immense help. Capo Dairy and Coca-cola were among the biggest business enterprises in the country, and hooking up with such heavyweights really smoothed my path. Peter Meiring, the man from Capo, gave me some financial sponsorship, while another Pieter from Coca-Cola expedited the issue of a travel permit for the coastal areas, then arranged for me to fly to port Sudan, from where his area manager would arrange transport northwards to the vicinity of the spot at which the Egyptian soldiers had turned me back. without Pieter’s intervention I would have spent a week just getting the permit, never mind the time and money I would have expended getting back to where I’d been. Peter was a great guy and we discovered we had a couple of things in common. As a young boy he had lived just two streets away from where my current house was, and we had played for the same rugby club, although at different times. He had played many games with famous Springboks like Calla Scholtz and had become quite renowned himself (he showed me newspaper clippings in which he was nicknamed ‘Boy George’ because of the long hair he wore at the time). Among the things Peter helped me to ‘discover’ was one of the most interesting sights in Khartoum, the ruins of the Shifa Pharmaceutical factory which was blown up in August 19998 by American missiles launched from a submarine in the Red Sea, 600 km away, because it was believed to have been a chemical-weapons factory sponsored by Osama Bin Laden and the Al-Quaeda terrorist organization. I marveled at the accuracy of the missiles, which had flattened the rugby field-sized building without even damaging the fences around it. Peter said that the United States government had now agreed to pay compensation to the owners of the factory. I looked at the wrecked factory, which had once employed 300 people, and decided that it was the end-result of a mixture of factors: mutual arrogance, the bombing of the US embassy in Nairobi and Osama Bin Laden’s very strong ties to the Sudan, where some of his family still lived, Still, the more I see of America’s aggressive involvements with some foreign countries the more I understand how the laymen there can build up serious resentment, so that all the good things the Americans do are negated by their diplomatic disasters. The South African Embassy’s 2005 New Year bash, which Sakurako and I attended at Ebrahim’s invitation, was a truly memorable one for a variety of reasons. The party was to take place at one of the staff residences, the main guests being Mrs. Mbeki (the President was still in Kenya) and the Deputy Minister of Energy and Mineral Affairs, Lulu Xingwana, who was there to see about strengthening economic ties with the region. As it turned out, Mrs. Mbeki could not make it because she got stuck in such horrendously gridlocked traffic that her trip was finally abandoned. This was just as well, because the party soon became pretty wild, thanks to a delegation of South African businessmen and women who let their hair down with a vengeance. The Deputy Minister resisted with admirable dignity a number of attempts to draw her into the ever more uninhibited revels on the dance-floor; another guest who kept his shirt on and his gentlemanly persona intact was the eloquent Mr. Phillip Malebe, who took the time to quiz me very thoroughly about why I had undertaken my trek and why I didn’t value my life enough. I laid it out to him in all the necessary detail so that he could understand exactly what was motivating me, and I obviously succeeded, because when I finally dried up he took me to one side and asked: ‘Do you need some help? I mean, would you appreciate some support from my side?’ and without even waiting for my reply took out his wallet and gave me$200 – completely unaware, like so many of my earlier benefactors, of what a great thing he was doing for me. It is at moments like this that one sees how much people want to connect with each other and offer their help. Then it was midnight. The clock struck the hour, we all congratulated one another in the usual way, and Ebrahim came to me with a very special New Year’s gift. Would I like to telephone Vasti? I didn’t have to think about it twice, and next moment he was on the telephone and dialing. The call went through instantly, and I was talking to vasti. It was a wonderful moment, and without warning the tears began to well up in my eyes. Ebrahim saw them when he came closer to check if I had got through, and he put his arm around my shoulders and gave me a gentle hug and a smile before going back to the crowd so that I could be alone with vasti and my emotion. That simple gesture was the final proof that I was not alone on this trip, that many people did care. A couple of days later Ebrahim provided further proof of his caring spirit, although a singularly unorthodox one with an unintentionally humorous ending, and I hope he will not mind if I tell the story here. On a visit to his office we fell to discussing the right way to use a long drop, and Ebrahim decided that I had not mastered the technique of the essential crouch. Naturally – and down he went in spite of a bad knee t show me exactly how to attain the position of greatest stability. Then a small disaster struck: his bad knee went on strike and I had to help him up again. This elicited a couple of bad jokes from me which Ebrahim, needless to say, fielded with professional aplomb In the mean time Paul Azzo was still going out of his way to support me in my usual visa hassles – I am convinced that I reminded him of his sons, who were a little older than me, so that he was as proud of my efforts as he would have been of theirs, and just as determined to see that I succeeded at what I was doing. Having grown up without a real father figure I am inclined to be drawn to displays of affection, and I think he realized this. Paul’s guidance and support also gave me something else which was just as important, although it was invisible to everyone except myself: a sort of stability which enabled me to handle my mounting frustration with bureaucratic systems bogged down in red tape and the general holiday spirit. Among other things he arranged some media interviews. One was with a team from the national TV station, in the course of which the producer had me scoop up and drink a couple of mouthfuls of brown river water because there was a Sudanese saying that if you drank from the Nile you would always return to it. The other was with newspaper journalists at the Sudnese Olympic team offices. To my surprise I was besieged on arrival by bystanders, but it turned out that they had mistaken me for an Italian soccer player who had just been signed by the city’s biggest team. Mischievous devil that he was, Paul made no attempt to deny it, just smiled and kept pushing me through the crowd. Then it was time to head for the border, the poorer for the theft of my new cell phone which the Ericsson people had donated as a replacement for my old one. I left it at the local internet café, realized what I had done and was back within 10 minutes, by which time either the café’s manager or the only other customer had pocketed it. Ebrahim and his wife, Nachua, had me over for a farewell dinner, and then I was ready for the flight to Port Sudan that Pieter had arranged for me. My travel plan was simple (in theory anyway, although I knew that actually carrying it out might prove a little more difficult). Once I reached Port Sudan I would head north wards till I was more or less opposite the point at which the Egyptians had turned me back. From there I would cycle south-eastwards as though I had just crossed the border, in the direction of Eritrea, Djibouti and finally Somalia. Pieter’s area manager, Ahmed, collected me at Port Sudan when I finally emerged after the obligatory search through my baggage and then spent three days negotiating with the local military commander to get me on to a truck that was headed for the border, since I didn’t have a military permit to travel anywhere in the frontier area. I ground my teeth more than once at this delay. Would this sort of time-wasting ever end? All I wanted was to be allowed to hit the road for the trip southwards. My time was not totally wasted, however.